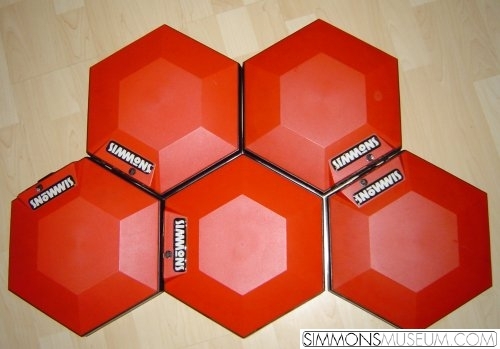 The Mark 5 pads are similar to the SDS 9 pads (Mark 4) and only differ by details, most conspicuous the matt shell showing the new Simmons logo. The screw to tighten the pad is now on the backside, for this purpose a hole is drilled into the shell. In comparison to the SDS 9 pads the surface and frame are not a unit anymore. The playing surface is an independant wooden plate with a rubber layer which is flanged to the frame via rubber sleeve which reminds me of a drum coat mounted on the wooden drum shell. Therefore the pad is much more easier to maintain as you can exchange the surface by e.g. a self built spare part. Strictly speaking it is possible too influence the rebound by tightness of the flanging screws. The pads have exclusively been delivered with the SDS 2000 brain.